Seth Hingham has hit a dead-end. At 35, he returns to his New England hometown after losing his job and the woman he had planned on marrying. 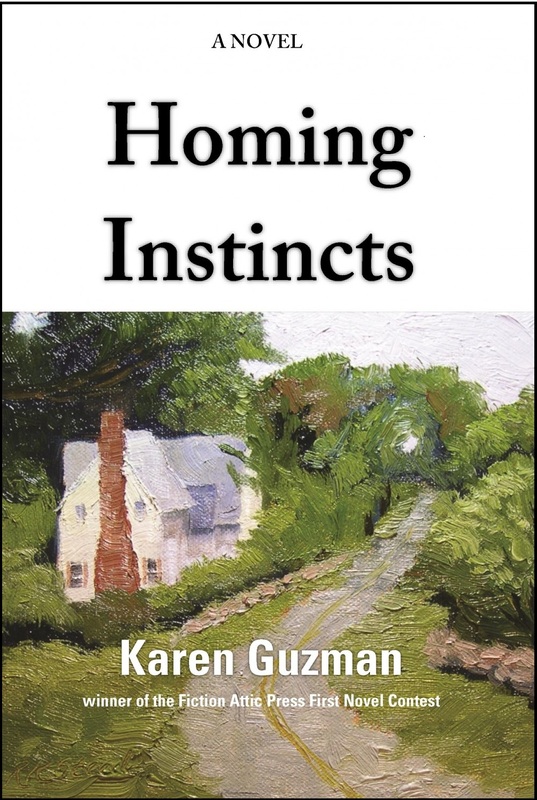 Homing Instincts – a new novel by Karen Guzman – traces Seth’s struggle to redirect his life and lay to rest lingering ghosts, including one from a long ago accident that killed a childhood friend. Q: So tell us how your journey as a writer first began. A: It seems I’ve always been writing. As a child, I wrote short stories and descriptive passages of things that caught my fancy. I must have been about nine when I began writing short stories and stapling the pages together to make “books.” I began writing fiction seriously in my twenties. A: Maybe not “voracious,” but pretty enthusiastic. I still am. One of my greatest pleasures is curling up in bed with a good book. I’m always reading something. Q: Who are some of the authors whose books we might have found on your childhood bookshelves? Meindert DeJong, whose children’s classic Hurry Home, Candy stole my heart. I didn’t want to return it to the library. I went on to read most of his books. Walter Farley, wonderful animal tales. E.B. White, Charlottes’s Web, bittersweet even as a child. Marjorie Kinnan Rawlings. The Yearling was a landmark book for me. I loved the natural descriptions, the relationship between the boy and his fawn and the dramatic turn it all takes. Jean Craighead George. Julie of the Wolves is a sophisticated, sensitive children’s masterpiece. Love her work. Marguerity Henry. I think I read every “Misty” book. Couldn’t get enough. Jack London, Call of the Wild and White Fang. Oddly enough, Booth Tarkington’s The Magnificent Ambersons had a big impact on me in about 5th grade. My parents had the book in their own collection and I somehow began reading it. Q: As an adult, what kinds of stories are you naturally drawn to? A: I seem to be dawn to stories that feature protagonists who must remake their lives, or find their way again, after major disruption or loss. Why? Good question. I guess because we all encounter this scenario so often in our own lives. I also like stories that include spiritual elements or longing. Q: What was the inspiration behind your debut novel, Homing Instincts? A: I attended the funeral of a man I had never met the summer before I began writing Homing Instincts. He was the father of my husband’s good friend, and judging by the turnout at the funeral and the tributes paid him, he was a dearly loved and respected man. I began wondering what kind of life a person leads to be remembered so fondly. At first, I thought I wanted to write about the deceased father, but it didn’t take me long to realize that it was really the man’s son whose story I wanted to tell. Q: It’s interesting to note that your first-person narrator of the story is a man. What, for you, are the challenges of writing from a male perspective so as to keep the voice and mindset authentic? A: I’ve always been close to and comfortable with men as people, as individuals. I have three brothers, and I’ve always had male friends who tend to confide in me. That said, when Homing Instincts, I did have to occasionally stop and ask myself would this male character say this, like this? I sometimes had to back up a bit, not just because the character was a man, but because he was a unique, individual character, who also happened to be a man. I just followed his lead. Q: Aspiring writers often forget that the physical environment and backdrop of the story can play as much – and as crucial – a “character” role as any of the actual people in it. For Homing Instincts, why did you choose the picturesque landscape of New England? Give us an example of a scene that you believe could not have been played better somewhere else. A: The forests and coastline of Connecticut play such a big part in this book. As a wildlife biologist, the main character is drawn to the natural world. He finds comfort and a connection to all living things. New England was a natural choice, because I live here and I love the landscape and the seasons. The ambiguity of the weather—its dramatic swings and the resilient natural world that bends to them—is a wonderful, atmospheric tool for scene setting and for character development. One scene that would have been difficult to place elsewhere: the politically tinged protest when state officials cull the deer herd at a state forest preserve. The shifting, provocative skies overhead and charged atmosphere are pure Connecticut. The scene is, in fact, based on a similar, emotionally charged issue that pitted deer lovers against deer haters years ago. Q: Describe your process for developing your first novel. For instance, did you work from a formal outline, make things up as you went along, do extensive research, etc.? A: After writing about fifty pages just to capture the voice and get something on paper, I created an outline. I like outlines, because they keep me moving forward. But my outlines are very broad and I fill them in as I go along. I never project more than a scene or two into the storyline. I kind of just lay out plot points, big things that I know I want to have happen. The arc of the story connecting these points is created on the fly as I write. Q: How long was the process from start to finish? A: About four years. But they were four years when I also changed day jobs twice, moved, and had a baby, so, you know, a lot was going on! Q: How do you find – and make – the time that being a serious writer requires? A: As best I can. It’s not easy. All the writers I know face the same challenge of struggling to find time for our writing while living a life in this demanding world. Lunch breaks at work are crucial, so are the stolen hours late at night when my husband and son are both asleep and the house is at last quiet. Q: Did you allow anyone to read Homing Instincts while it was still a work in progress or did you make them wait until you typed “The End”? A: My dear friend and fellow writer, Cathy Cruise, did read pieces of Homing Instincts in progress. She stopped me from making all kinds of terrible mistakes. My husband and a second writer friend didn’t read the manuscript until it was finished. They both offered interesting insights, too. Q: How did you go about finding the right publisher for it? A: When I reached the point where I just honestly didn’t know how to improve the manuscript anymore (3-4 drafts in), I just started sending it out. I queried agents as well as small presses. Several agents really liked it, but felt literary fiction was just too hard to break into at the moment. Some offered helpful criticism. I did another rewrite and kept sending it out. Then Michele Richmond from Fiction Attic Press contacted me in late December 2013 to say my manuscript had won the Press’ First Novel Contest and to offer me a publishing contract. I was—and still am—overjoyed. A: That selling a book is even tougher than I’d realized. That persistence matters more than anything. That good writing does get noticed. Agents will read your query—and so will editors—if your sample is well written…having solid credentials helps, too. That small presses are publishing some of the best literary fiction being produced today, and we should all support them. And that as writer trying to publish today, you absolutely need a social media platform and a website. Authors have to work really hard to build readership. Q: Tell us some of the things you’re doing to promote your book. Which ones seem to be the most effective in generating a buzz? A: It’s still early in the process since my book just came out this month but I’m networking with other authors, especially around New England. I’m reaching out to independent booksellers, libraries and writers groups to arrange for readings. I’ve announced the book’s publication on my social media platforms, and I’ll ratchet it up in the coming months. I’m also tapping into my old MFA crowd, down in Virginia and around the country to raise awareness and get the word out. Q: What’s next on your plate and how is it different from – or similar to – Homing Instincts? A: I’m working on a new novel, and it’s a huge departure from Homing Instincts. It’s about a woman facing a sort of midlife crisis in the wake of her divorce. It’s a third-person narrator, so different from the first-person voice and so freeing. Q: Where can readers learn more about you and your upcoming projects? This entry was posted in authors, fiction, interviews, Karen Guzman, literary fiction, New England, redemption, relationships and tagged fiction, Karen Guzman, literary fiction, New England, redemption, relationships.